Did you know that Mickey Mouse was a DeMolay? Well, in truth, Walt Disney was a member of DeMolay, and knew “Dad” Frank S. Land very well. He was the 107th member of Mother Chapter, and joined in March of 1920, at the age of 19, just as the DeMolay program was taking shape. He was one of “Dad” Land’s boys. By this time in his life he had already dropped out of school to get a job selling candy and magazines on the train that ran from Kansas City to Chicago at age 15. At age 17 he couldn’t get into the Navy or the Army, so he went to France and served as a Red Cross ambulance driver during World War I. Fearless behavior for a very young man! Walt Disney’s success was not immediate. He moved to Hollywood in 1923, and failed several times before creating Mickey and Minnie Mouse. His Mickey Mouse cartoons were short filler pieces between feature films. He made a living, and had some spin-off success with daily and Sunday Mickey Mouse comics beginning in 1930. He won his first Academy Award for a short animated feature in 1932 and repeated in 1933. His first feature film, Snow White and the Seven Dwarfs, was released in 1937. This was the most important time in Disney’s professional life, when he was creating the foundation of his enormously successful company. 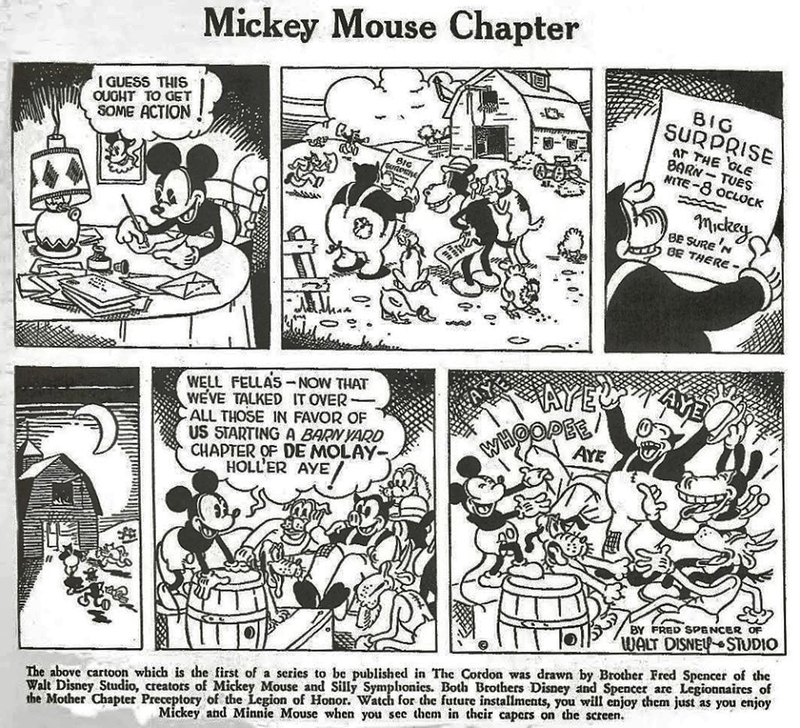 From 1932 to 1935 there were 5 DeMolay comic strips created, featuring Mickey Mouse, Pluto, Horace and other early Disney characters participating in meetings of Barnyard Chapter, Order of DeMolay. Although they bore Walt Disney’s branding signature, one of his many illustrators, Fred Spencer, also a former member of DeMolay, was credited with creating these strips. These were published in The DeMolay Cordon, the monthly magazine about DeMolay, for DeMolays. Fred Spencer was tragically killed in an automobile accident in 1938 and any chance of further Barnyard Chapter comics seems to have died with him. In July of 1936, Disney returned to Kansas City to participate in the conferral of the Legion of Honor on 100 candidates at the first Founder’s Conference. He was asked by “Dad” Land to address the thousands of boys and advisors who were in attendance, but Disney balked. The man who was the original voice of Mickey Mouse—who had been heard by millions of people around the world-- was terrified of public speaking! With a little coaxing by “Dad” Land, and a little courage of his own, Disney broke that fear and gave a rambling but heartfelt presentation about his career and the influence of DeMolay principles in his daily life. “Dad” Land always knew how to challenge his boys for more, and better, for their own good! At the DeMolay Service and Leadership Center is an original pen and ink color picture of Mickey Mouse wearing the original DeMolay emblem with the helmet, shield and sword, as Walt Disney would have known it to exist in the 1920’s. Whether Disney himself created this emblem or had one of his illustrators draw it is immaterial—it was a gift from Walt Disney to his esteemed advisor and life-long mentor, “Dad” Frank S. Land. 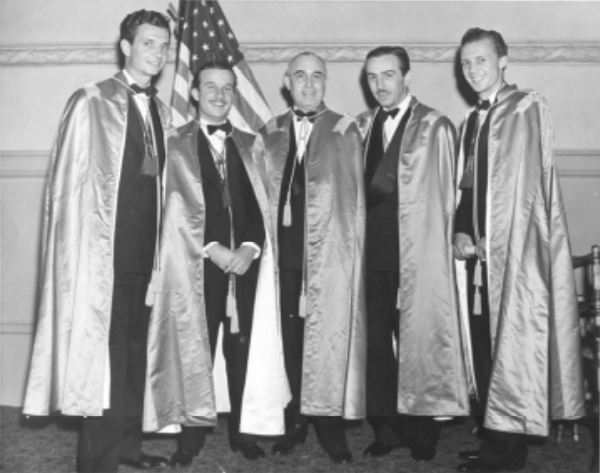 Walt Disney’s pride in his DeMolay association remained with him his entire life. He daily wore a DeMolay ring on his left hand into the 1940’s when he finally replaced it with another to symbolize his wedding bond with his wife Lillian. He attributed his life and business success as a direct result of his involvement with DeMolay. “Dad” Land valued Walt’s contributions to DeMolay, and gave him his the Founder’s Cross as a personal token of their mutual loyalty and respect. 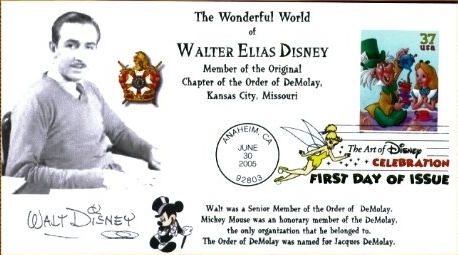 And if you think about all of the Disney movies and productions he personally supervised (prior to his death in 1965) there is no doubt that the values Walt learned in DeMolay were guiding principles in defining the characters and the message of each of his live-action and animated movies. 1.) Do you think these comic strips featuring Mickey Mouse were a big deal for the DeMolays of the 1930’s, or just a casual amusement created by one of thousands of Senior DeMolays at the time? 2.) 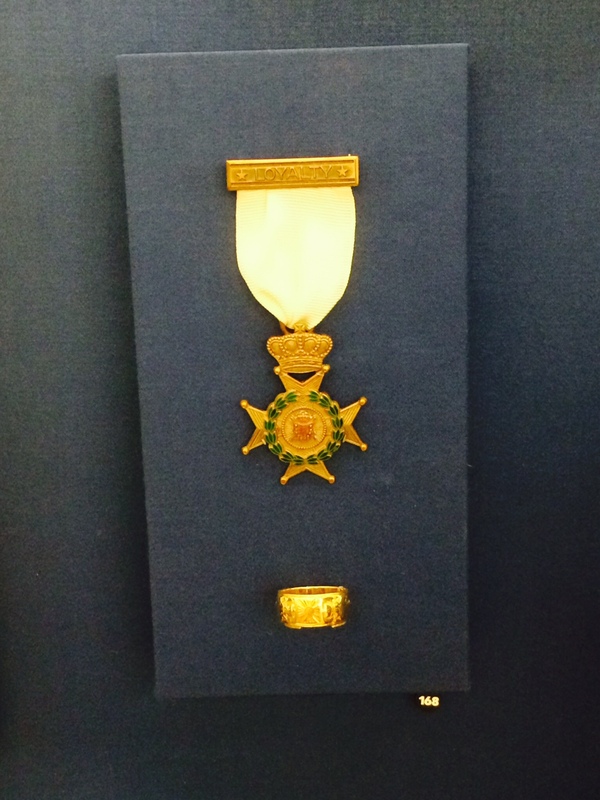 “Dad” Land gave the Legion of Honor to Disney even before he was a great success. He was just getting his business off the ground at the time, and he was living far away from his home Chapter. Can you imagine why “Dad” Land honored Disney at such an early time in his career? 3.) Walt Disney’s learning of leadership skills from his DeMolay activity didn’t end when he turned 21 and moved to California. It took a special mentor to convince him that his brothers would be supportive and glad to hear from him. Did you ever think that your learning through DeMolay might not end when you reach majority? Can any advisor relate to this? 4.) Have you ever thought about someone being “too old” to join DeMolay and get anything out of it—like a high school graduate or a college student? Walt Disney was a member for only two years until he reached Majority age of 21. But what he got out of DeMolay lasted him a lifetime. He used the seven cardinal virtues of DeMolay as guiding principles in his family, business, religious, civic and social life. 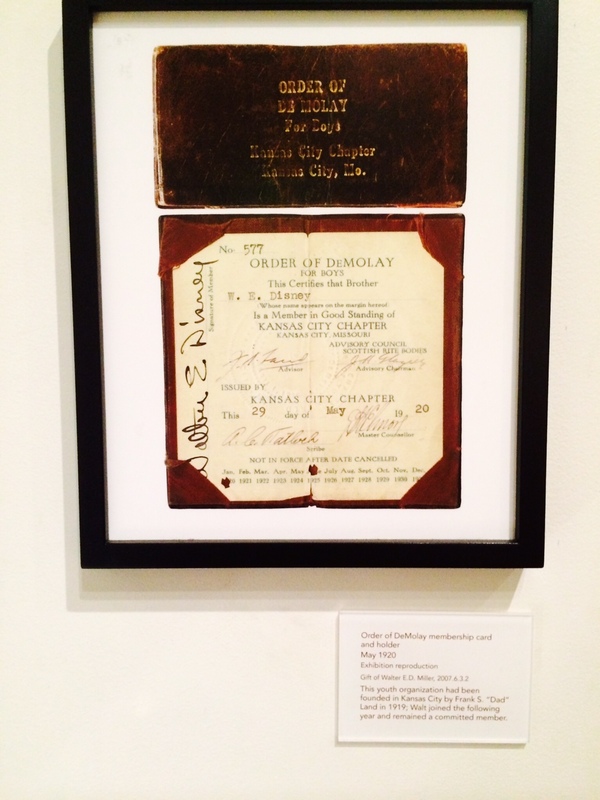 Right now, can you think of any young men in the 19-20 age range who could STILL benefit from membership in DeMolay? Will you ask them to join? Please note: We can share these strips and images with our friends for their historical significance to our Order, but the Disney Corporation owns ALL images of Mickey Mouse and other Disney characters when it comes to marketing and merchandising, so we cannot use this on a t-shirt or other apparel or any item for sale and/or distribution.